I made my 3rd watercolor journal with another piece of fabric that I dye-painted - this time striped using corn dextrin resist with procion MX dyes. 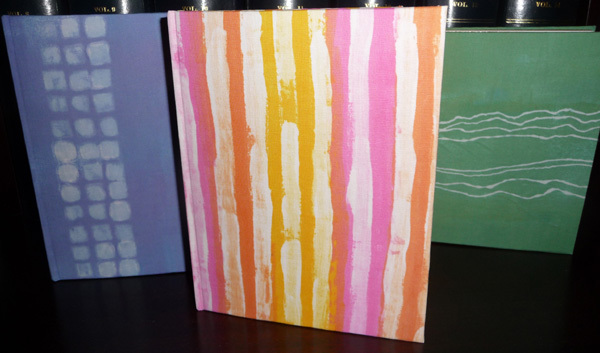 This is a 6 X 8" watercolor journal containing Fabriano Artistico 140 lb Soft Press paper - 6 signatures with 2 folios each. The bookcloth was prepared by fusing my fabric to Thai mulberry paper using Wonder Under - see more about the method here. I used color-coordinated MiTientes paper as end papers. There is still one more piece of fabric that I made in this first batch, and since I'm now using a big roll of Fabriano Artistico paper, I will make a 4th book to gain more experience handling the big pieces of paper instead of the usual 22 X 30 inch sheets. There are 48 single pages in each book so will have enough watercolor journals on my shelf to last 5-6 months! 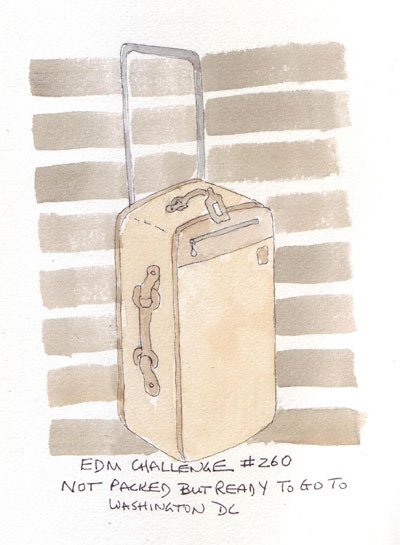 I still enjoy completing the EDM Challenges because they take me out of my comfort zone and help me decide what I should draw/paint for at least one of my daily sketches each week. However, I regularly complete them 1-2 weeks after the challenge was published, as I try to settle on a specific image. 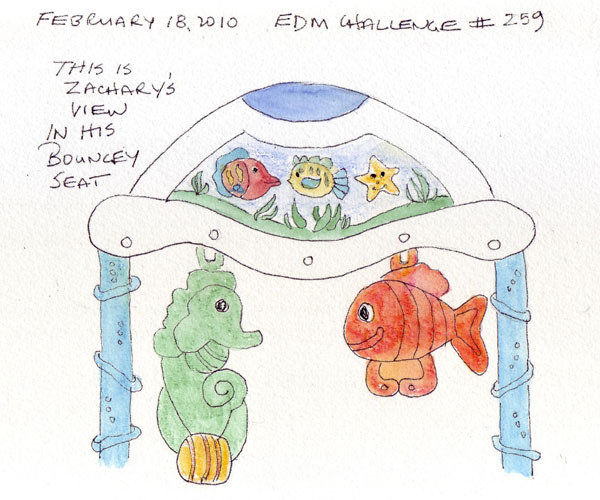 This time it was Challenge # 259: Draw a view from your pet's perspective. We don't have a pet! 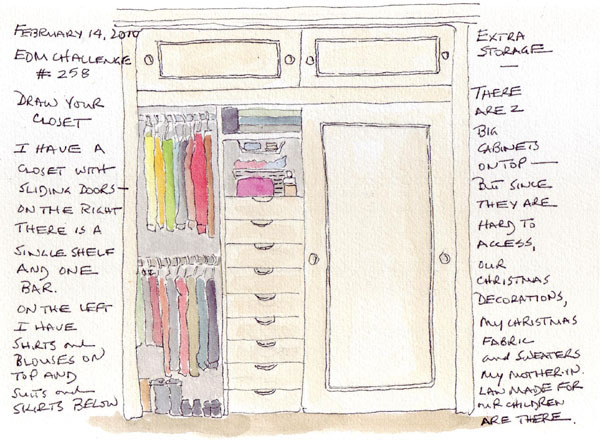 I sketched one half of my clothes closet. We live in an apartment building in New York City - with the types of closets that were popular in 1926, i.e. no walk-in closets. However, we are luckier than one of our sons who lives in a house from the late 1800s in Capitol Hill, Washington DC. They have only a single closet in the original house and rely on armoires as in the past. Here is my sliding door clothes closet (part of a post-1926 renovation), with only half exposed. Challenge #259: Draw a view from your pet's perspective. Although we don't have pets, I realized that my 5 month old grandson spends his days being moved from one place to another by the grown-ups in his life. And he has a limited view from some of these spots, much like a pet. It took me longest to decide how to answer this challenge. Here is 5 month old Zachary's aquarium view when he is in his bouncey seat. This is my small suitcase that I take away for short train or car trips, but it is not yet packed for my March trip to Washington DC. 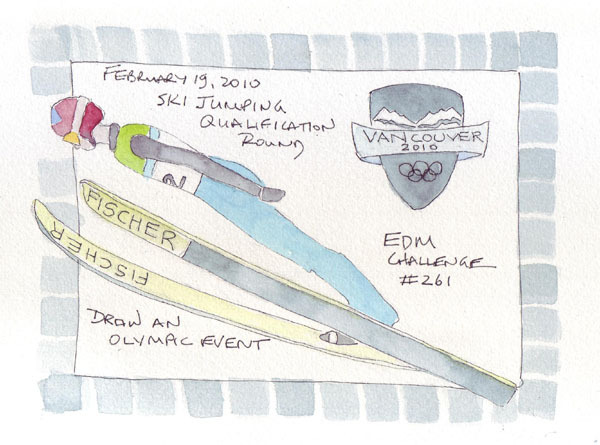 Although the ice skating events are my favorite, I really love the "soaring" ski jumpers, with their extremely clean lines. I just finished making my second watercolor journal using book cloth that I made from dye painted fabric (procion MX dyes and corn dextrin resist). The first one can be seen here. This 6 X 8"book is made using 140 lb Fabriano soft press watercolor paper and consists of 6 signatures with two folios in each. 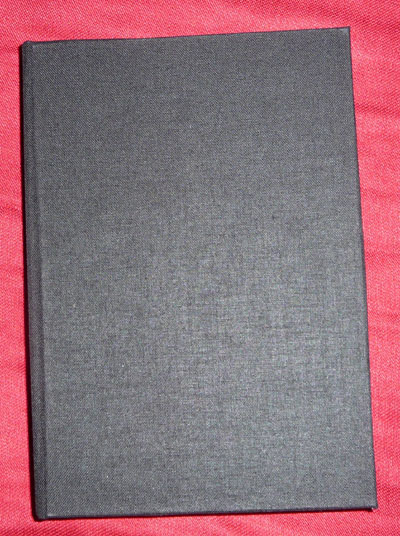 I'm thrilled to complete another one. 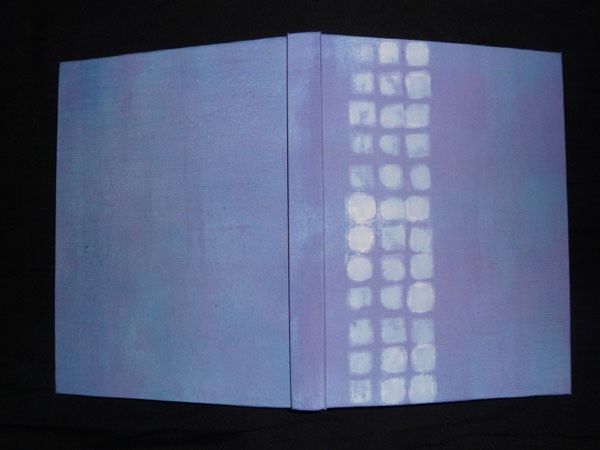 The Book Cover - made with blue and purple dyes. I made a second watercolor journal this week - using Gwen Diehn's instructions for a sketchbook with removeable pages. EDM Members can access these instructions in a file on the message board. This looked like a fun technique to know - even though I like working in journals that can be numbered and stored on a shelf. 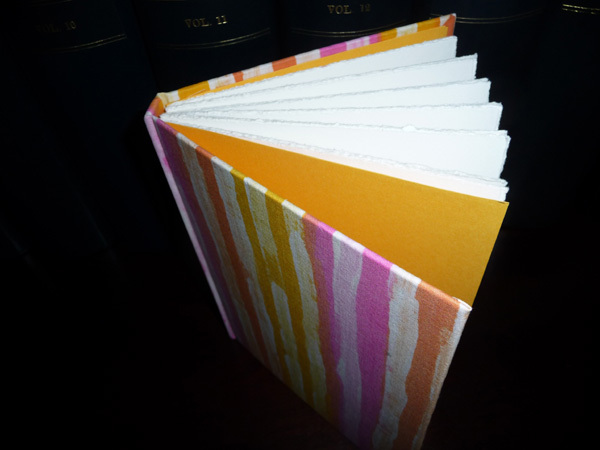 Exterior of 5 X 7.5" Book: Made with Fabriano Artistico (8 folios in 4 signatures) and TexLibris bookcloth. 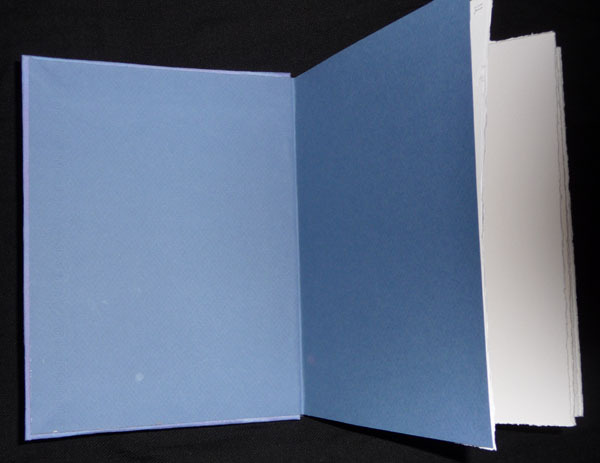 Open Book - showing the spine: The watercolor paper was used as end papers to insert the page block into the cover, so only one of the folios in each of those two signatures are removeable. 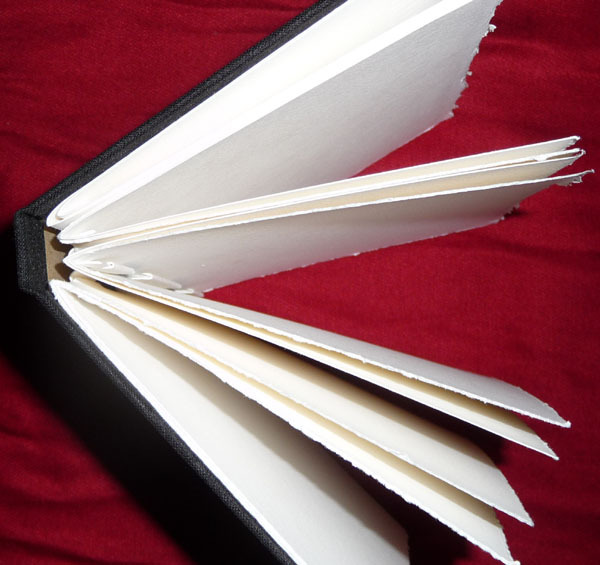 There is supposed to be a peper hinge which goes through the concertina tunnels to hold each folio in place. I just happened to be in the New York Garment District, and saw the perfect size "bones" to use instead. 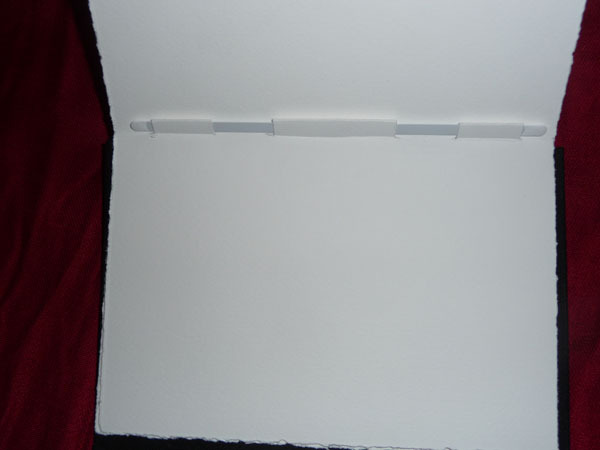 Here is a photo showing the bone passing through 3 concertina tunnels and fixing the folio. Each folio makes 4 pages in the book. My opinion of this pen is still open, I find it impossible to draw with but easier to use after I have done a quick pencil sketch. So in my daily sketches, I'm trying to periodically use it instead of the Sakura Pigma Micron or Zig Millenium pens. 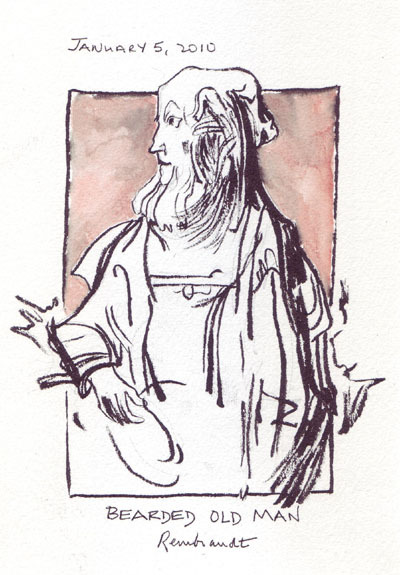 I copied another Rembrandt drawing, in pencil first, because he achieves so many line widths in his drawings. My biggest discovery was - this is watersoluble ink in the Pentel pen. So now I know it will never be my regular pen for pen, ink, and watercolor wash drawings. I then decided to use it on one of my own sketches, instead of practicing from Rembrandt. 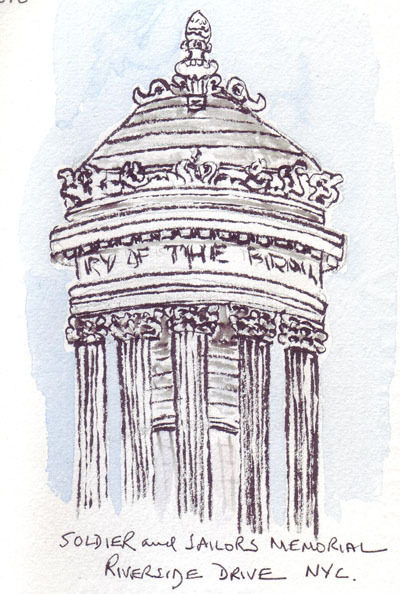 While my baby grandson was asleep I sketched the top of the NYC Soldiers and Sailors monument - which can be seen out of my son's apartment window. Zachary is a master of 30 minute naps, so I knew that I had limited time to do the pencil sketch and then complete it with the Pentel pen. It was fast, loose, and fun. But I had to be very careful adding a little watercolor because the ink is not permanent. I thoroughly enjoy my monthly figure drawing sessions - and last evening one of the two models was the lovely pregnant woman from my last session. The fast, i.e. 2 minute and 5 minute sketches are the most fun for me, probably because I get bored during the 20 minute poses when I think I should add faces and hands. Feet are rarely an option because I can't see them from where I sit. I realized that I chose to upload only the drawings that I did of the pregnant model. (there are always 19 total) She is just glowing - with a beautiful calm face and lovely smile.